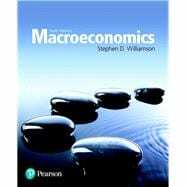 Macroeconomics uses a thoroughly modern approach by building macroeconomic models from microeconomic principles. As such, it is consistent with the way that macroeconomic research is conducted today. This approach allows for deeper insights into economic growth processes and business cycles–the key topics in macroeconomics. An emphasis on microeconomic foundations better integrates the study of macroeconomics with approaches learned in microeconomics and field courses in economics. By following an approach to macroeconomics that is consistent with current macroeconomic research, you become better prepared for advanced study in economics. Stephen Williamson is a vice president at the Federal Reserve Bank of St. Louis. He received a BSc in Mathematics and an MA in Economics from Queen’s University in Kingston, Canada, and his PhD from the University of Wisconsin-Madison. He has held academic positions at Queen’s University, the University of Western Ontario, the University of Iowa and Washington University in St. Louis, and has worked as an economist at the Federal Reserve Bank of Minneapolis and the Bank of Canada. Professor Williamson has been an academic visitor at the Federal Reserve Banks of Atlanta, Cleveland, Kansas City, Minneapolis, New York, Philadelphia, the Bank of Canada, and the Board of Governors of the Federal Reserve System. He has also been a long-term visitor at the London School of Economics; the University of Edinburgh; Tilburg University, the Netherlands; Victoria University of Wellington, New Zealand; Seoul National University; Hong Kong University; Queen’s University; Fudan University; Indiana University; and the University of Sydney. Professor Williamson has published scholarly articles in the American Economic Review, the Journal of Political Economy, the Quarterly Journal of Economics, the Review of Economic Studies, the Journal of Economic Theory, and the Journal of Monetary Economics, among other prestigious economics journals. This text reflects the author’s views, and does not necessarily reflect the views of the Federal Reserve Bank of St. Louis, the Board of Governors of the Federal Reserve System, or the Federal Reserve System.